We entered the gates of the Mount Kenya National Park, encountering terrain increasingly requiring our 1982 Rover’s four-wheel drive; a harbinger of the conditions to come in the following days. Turning off the Embu-Meru paved roadway, the increase in altitude became evident as the environment shifted from the dense and lush vegetation of the Afro-Montane Rainforest, to the low-growing shrubbery of the Alpine Moorland zone until we reached our official base camp at Lake Elice at 11,300ft. 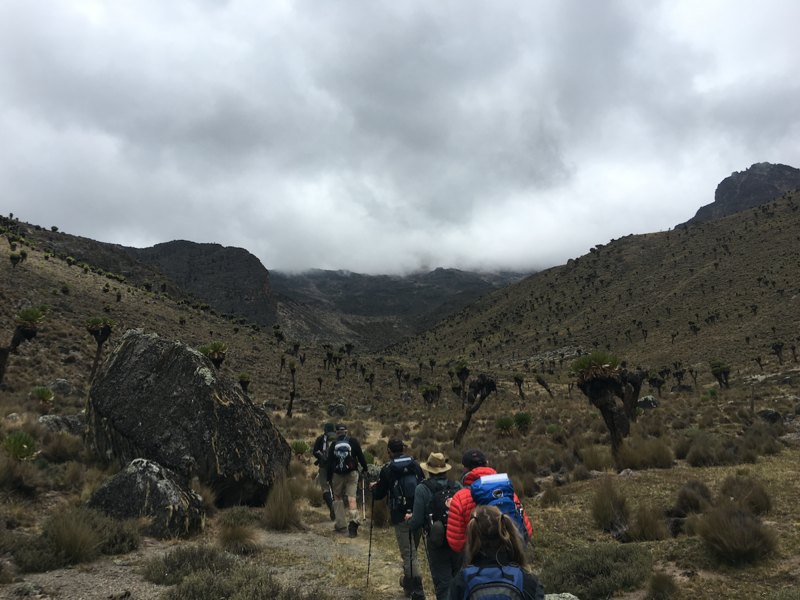 We took the next day to acclimatize before continuing along the Chogoria Route, sighting leopard droppings and a herd of grazing eland at 13,800ft along the Cresting Ridge Trail, settling into our next base camp at Lake Michaelson. 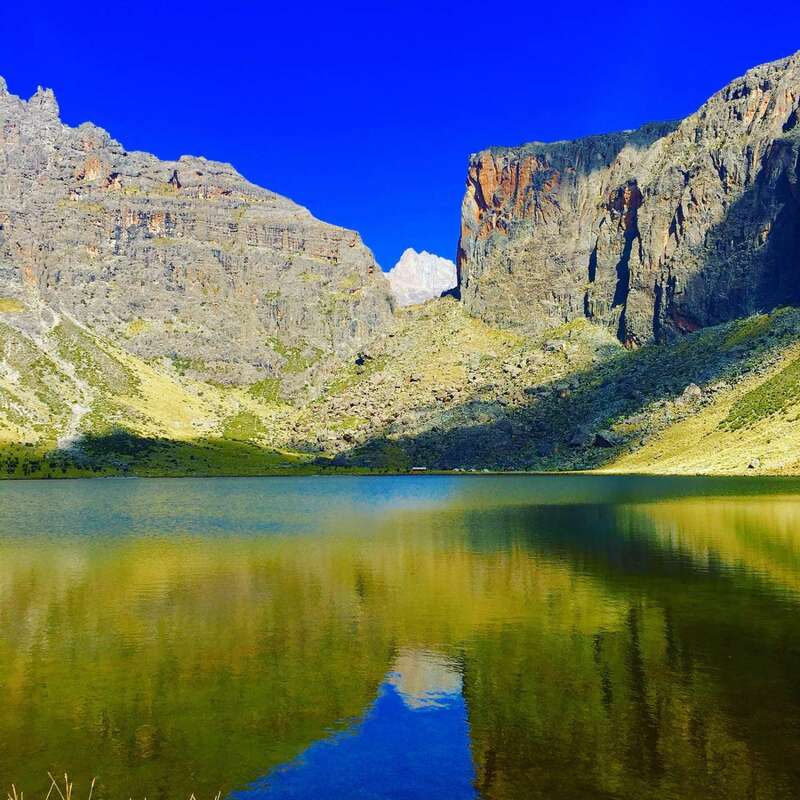 The lake sits cradled at 13,100ft in the hands of the surrounding mountainside which framed the rising sun – a breathtaking sight. Here we spent another day to acclimatize and explore one of the three waterfalls which appeared to empty into the misty void of the Three Gorges Valley a few miles from its original source. The following morning we were awakened by the sunrise illuminating our tents and we began preparing for the hike that would take us to the final moonscape campsite, Simba Tarn, situated at 15,200ft. Here we planned our final ascent, with the assumption that the mountain would maintain its ancient stillness without sudden change of condition. Yet at midnight before our summit, a rare 60 mph windstorm swept through the sparse landscape of our camp threatening to clear the site, violently awakening members of our team who desperately scrambled to secure the canvas tents to rugged ground in pitch darkness… a reminder that life can be precarious when confronted with unpredictable circumstances – mother nature rules! At 4:30am we rose in frigid temperatures, eager to begin our ascent. Disoriented both by altitude and relative darkness, we scaled the increasingly exposed terrain. Our eyes fixated on the ground ahead and only released when the warmth of the rising sun touched our exposed skin. Approaching the top, we now viewed the sun peaking through the clouds as its rays streaked from the heavens lighting the steep trail ahead. With this sensation, we could see that we were approaching the summit. About 30 minutes later, at 8am on August 5th, our team summited Point Lenana at 16,400ft and triumphantly raised the March to the Top flag. We gathered in prayer and reverence, sharing in a moment of profound joy at having achieved our purpose, honoring those donors who would now bring great change in the coming months and years ahead with their contributions. There was a newfound energy now surging throughout our bodies and minds in anticipation of seeing those people and communities which had inspired our journey. 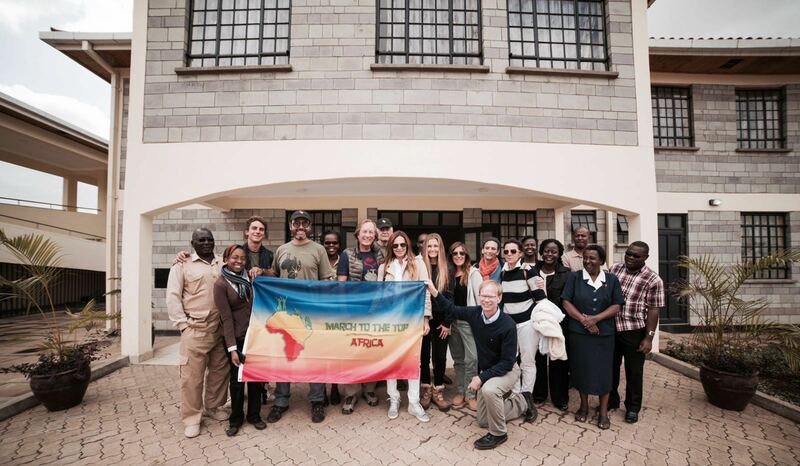 We arrived at the Lewa Conservancy in Kenya on August 6th. Our time at the Lewa Conservancy enabled us to observe first hand the brilliant work being accomplished there. Lewa’s enlightened governance of its 62,000 acres serves as a model for a holistic approach to conservation through the promotion of community development, education, tourism, and wildlife protection. A particular highlight was reviewing the highly trained Lewa Ranger team that M2T supports to provide security in battling poaching throughout the region. The next day, we traveled to the Isiolo County Hospital in the predominantly Muslim community of Isiolo where a M.E.A.K. medical eye mission was taking place. In preparation for this particular mission, M.E.A.K. representatives and workers screened a total of 1,764 local townspeople and children in five surrounding villages up to 200 kilometers from the hospital. Following the screening, 162 men and women were brought to the hospital for sight recovering cataract surgeries, 8 for tarsal plate rotation correction, and 5 children were transferred to Nairobi for specialized procedures. 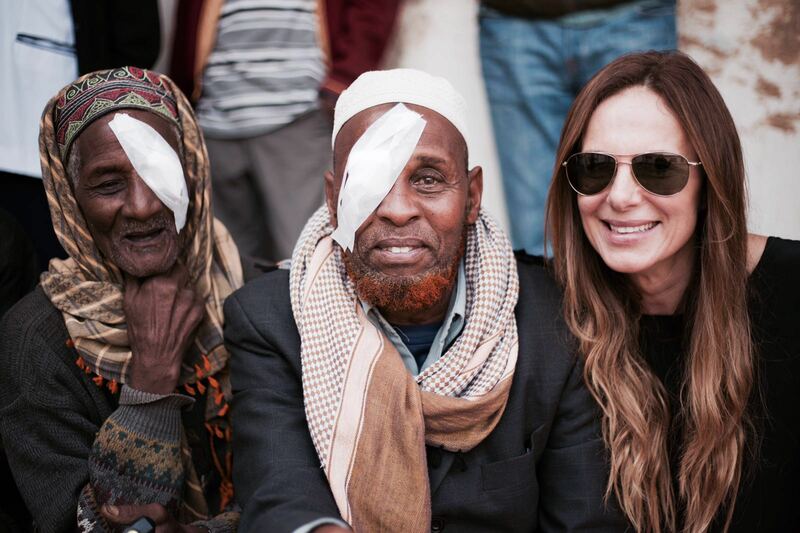 Upon our arrival, we observed multiple cataract surgeries in-action and witnessed those whose surgeries had already taken place the previous day have their bandages unwound, allowing them to see the vibrancy of the world around them for the first time. We witnessed expressions and gestures of the deepest appreciation; smiles of the elderly whose faces beamed, whose wizened skin now exposed dimples, and whose weathered hands clasped ours with sincerity and renewed life. The following few days were spent among the children of New Hope Orphanage & Clinic, which is one of the largest HIV dedicated orphanages in Kenya. Here we actively participated in the children’s daily lives; playing with the children, sharing in each precious moment of their day and becoming enriched with the lessons they silently taught us about appreciating the simple gift of life. The children’s past, however full of struggle and neglect, seemed only a distant memory as they so vibrantly and vocally expressed with us their dreams and passionate belief that they could become anything and anyone they strived to be. Through the gates of New Hope we entered a world of love. A world of compassion. A world of giving. And a world of hope. While present at the orphanage, we witnessed the New Hope School’s year end ceremony, where valedictorians of each class were awarded for their achievements with plastic washing buckets and ceramic mugs, valuable tools which were received with pride and genuine appreciation. It was also at this ceremony that the first ever Sunshine Fund Scholarship was given to the highest achieving students of this graduating year, Purity Makena John and Anastasia Kathambi. Fellow climber and Sunshine Fund Founder, Gaia Murphy, was able to present these life changing awards in person… a heartwarming moment for all. As we neared the end of our journey, we drove to the Dandora Visitation and Maternal-Child Health Center, which March to the Top collaborated with St. Monica’s Parish, the Holy Cross Parish in Dandora, The Tabit family, and the University of Notre Dame’s Ford Program to develop. The hospital was built in the core of Dandora, one of the poorest slum communities on the outskirts of Nairobi – a place of devastation, brutality, and evident poverty. Dandora Visitation and Maternal-Child Health Center was built in response to the “Dandora Human Development Study”, funded by March to the Top and implemented by the Holy Cross Parish, which sought to provide research and development to an area in which the community believed was the most in need of improvement. We found that in Dandora, women are consistently rejected from surrounding local hospitals and live without access to proper care and opportunity due to the stigma surrounding their community. They now can finally be recognized due to the Dandora Visitation and Maternal-Child Health Center that provides basic laboratory and outpatient care, advanced delivery technologies, pre- and post-birth care, staff training facilities, maternal counseling programs, two pediatric wards, and a dental clinic, all of which will be equally accessible to the entire community of Dandora. The center now seeks sustainability as it officially opens it’s doors in October. Looking into the future, Father Dowd hopes for this clinic to be “a center of research”, serving as a voice for the Dandora community where the people have been silenced so long. 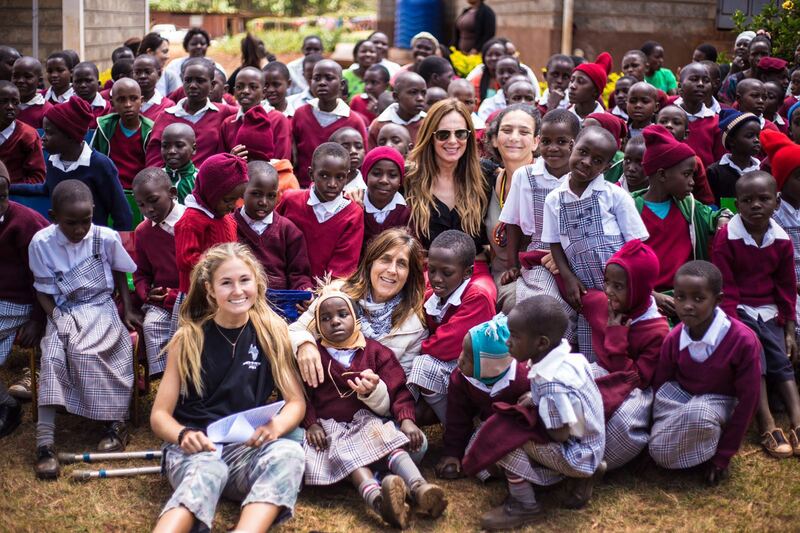 Welcomed by the richness and vibrancy of Kenya we left with a renewed purpose. When one can be so easily blinded by the abundant blessings we have, the opportunity to be exposed to a land where every aspect of life is a gift, we are reminded that in order to truly live a fulfilled life we must constantly return to the core values of gratitude, compassion, and unconditional love for all those that surround us. We have been given the greatest gift, the means to share our love and make a true difference in the lives of those who surround us. There is poverty in the world, yes. There is violence and pain and sorrow. But there is also laughter, joy, awareness, and connection; and there are those who contribute to this chain of giving, seeking to make a difference. As each of the children at New Hope welcomed us into their embrace, each recipient of M.E.A.K. medical attention clasped hands with us, and each Dandora mother was served, we left them with a promise. A promise to not leave a single one of them behind. We all have a family now across the sea, maybe not in blood, but in heart and spirit. We must give these children and communities the same opportunity we have to pursue dreams. These people have given us the greatest gift – the gift of purpose. This is only the beginning. The journey continues.